State authorities euthanized another five California sea lions at Bonneville Dam this week, bringing the total to six that have been lethally removed so far this year. 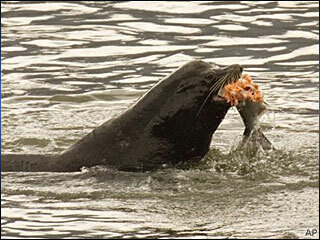 Seven sea lions were captured in the live traps below the dam on Tuesday. One was branded and released and another released without additional branding. The rest were killed by lethal injection, said Roger Fuhrman, spokesman for the Oregon Department of Fish and Wildlife. The five animals had been identified as preying on salmon at the man-made bottleneck created by the dam. Washington and Oregon fishery managers began live trapping of animals last week. About 60 sea lions have already been identified, by branding or naturally distinguishing marks, as nuisance animals eligible for lethal removal under a federal permit granted through the Marine Mammal Protection Act. Ten sea lions were euthanized last year by lethal injection, and four others were transferred to zoos in Chicago and Texas.